What you need to know about ethanol – BG Products, Inc. Does the use of ethanol reduce fuel economy relative to conventional gasoline? Yes. The consumption of fuel relative to miles/kilometers traveled is directly related to the energy content. Conventional gasoline has an average energy content of 114,000 BTU/gallon. But, energy content of conventional gasoline can vary up to 7 percent from one fill up to the next! Ethanol alone has a value of 76,100 BTU/gallon. So, E10 fuel—conventional gasoline blended with 10 percent Ethanol—will give a value of about 111,000 BTU/gallon, or a 2.6 percent reduction from conventional values. That’s low enough that the average driver may not see a decrease in fuel economy. Conventional gasoline blended with 85 percent ethanol is a different story. E85 has an average energy content of 81,800 BTU/gallon. A vehicle using E85 would require 1.39 gallons to go the same distance as one gallon of conventional gasoline. In other words, the average driver will notice a difference in the thickness of his wallet after switching from conventional to E85 fuel. But it’s not the worst; other alternatives such as compressed natural gas (CNG) have a value of only 75,000 BTU/gallon. That means it would burn 1.52 gallons to go the same distance as one gallon of conventional gasoline! Can any vehicle use ethanol-containing fuel? But, every gasoline-powered vehicle manufactured since the early 1980s can use up to E10. However, above 20–30 percent ethanol, the computer in non-flex fuel vehicles cannot make the adjustment and a lean fuel/air mixture will result. Can ethanol-containing fuel affect cold starting? Yes. For example, on a cold winter morning in Minnesota, an E70 fuel will start a vehicle only because 30 percent of the fuel is a volatile fuel fraction. But, E85 fuel may cause significant starting problems and a vehicle with E100 in the fuel tank may not start on a cold winter morning in Northern climates. Does ethanol-containing fuel dry the fuel system? Yes. Ethanol used for fuel blending is anhydrous—contains no water. Refineries typically do not mix ethanol with fuel because pipelines contain a significant amount of water. E10 fuel can hold a limited amount of water, which is highly temperature dependent, before the fuel experiences phase separation (turns cloudy) and a large percentage of ethanol and water settle to the bottom of the vehicle’s gas tank. If this happens, the vehicle will run very poorly. One solution is to add a relatively large amount of BG Ethanol Fuel System Drier, Part No. 281, to the tank. Raise the temperature of the fuel to around 70°F in a warm garage. Slosh the fuel in the tank to promote mixing. And, hope the temperature remains warm enough so the fuel can be used before the next cold spell. Or…drain the water/ethanol mixture from the bottom of the tank. Can ethanol-containing fuel cause fuel-filter plugging? Yes. If a fuel supply system is switched from conventional gasoline to E10 or E85, much of the sediment, oxidation residue and other contaminants in the storage tanks and lines are dissolved or suspended in the new fuel. These contaminants may find their way to the filter until a sufficient amount of the ethanol-containing fuel has been turned over. Ethanol-containing fuel also contains water, which carries dissolved salts and contaminants, and can cause premature filter plugging and injector fouling. But, if the fuel storage and delivery system are clean and well maintained, no additional filter plugging should occur—outside of what is typical for conventional gasoline. Can ethanol-containing fuel cause engine deposits? Yes. E10 fuel is the worst blend in terms of deposit formation. It can create significantly more deposits than conventional gasoline. Oddly, E85 fuel is generally considered better than conventional gasoline in terms of deposit formation. But solubility problems have been linked to the type of detergent additive used in E85 fuel. These detergents would be the types typically found in conventional gasoline (e.g., polybutene amine). Polyether amine, such as that found in BG 44K® have been shown to be stable in ethanol-blended gasoline. Can ethanol-containing fuel corrode the fuel system? Protect the fuel system by neutralizing acids in the fuel with an amine-based dispersant, such as polyether amine, and adding corrosion inhibitors—BG Ethanol Fuel System Defender, PN 213, and BG Ethanol Corrosion Preventer, PN 212. Does ethanol-containing fuel help reduce emissions? Yes. Denver was one of the first cities to mandate the use of E10 fuel to improve air quality in 1988, and the program was very successful. As a result of this study, many cities have adopted E10 gasoline, some mandated by the Clean Air Act. The EPA mandates that states and/or municipalities maintain monitoring stations in the containment areas and specify an upper limit of 35-ppm carbon monoxide for a one-hour period and 9-ppm carbon monoxide for an eight-hour period. Monitoring stations are allowed only one exceedance of the air quality standard per year. Are fuel retailers required to label pumps that contain ethanol? Yes and no. The federal government is not involved unless the concentration of ethanol is above 10 percent by volume. But, many states require labeling. Are boats, small engines and recreational vehicles prone to problems with ethanol-containing fuel? Yes. Many vehicles and engines in this category were not engineered to use ethanol-containing fuel until after 1990. Problems are not inevitable but there’s a much greater chance of issues such as corrosion of fuel system components and deterioration of fuel lines and gaskets. Fiberglass tanks on boats manufactured before 1991 are particularly vulnerable to deterioration with the use of E10 fuel. Recreational vehicles typically go unused for extended periods of time and can draw water into the fuel tank, which will significantly aggravate the problem. Ethanol-containing fuel can also be significantly more oxidatively unstable compared to conventional gasoline. With the vehicle sitting over the winter months, ‘sour’ fuel can result in gummy deposits and an engine that will be very difficult to start the following spring. Naturally, the marine industry and small engine manufacturers are mostly against raising the limit on the maximum allowable concentration of ethanol and would prefer laws mandating the labeling of ethanol concentration at the retail pump. BG Products can help prevent the negative aspects of renewable fuels such as ethanol. 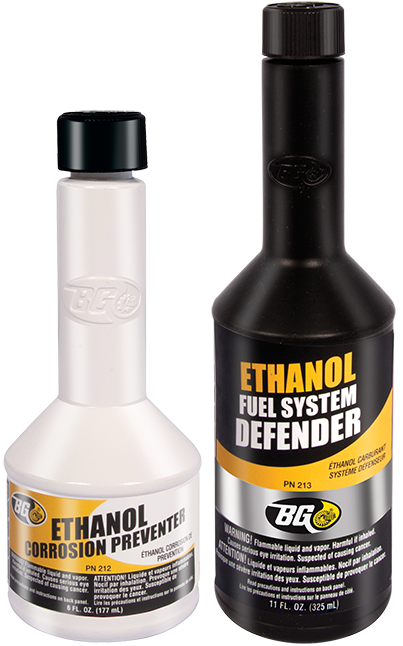 BG Ethanol Fuel System Defender and BG Ethanol Corrosion Preventer have effective multi-metal corrosion inhibitors, anti-oxidants and polyether amine technology to prevent the kinds of problems described above. Both products are highly recommended for the marine, small engine and recreational vehicle market. Add BG 44K® to quickly remove the deposit formations caused by the use of E10 fuel. BG MOA® helps neutralize the combustion acids and corrosive effects of ethanol in the crankcase and upper cylinder area plus provides excellent anti-oxidation protection. E10 fuel accelerates deposit formation on rings. And, stuck rings not only cause excessive oil consumption, but also allow oil to enter the combustion chamber and soil spark plugs and sensors. Use BG Compression Performance Restoration, Part No. 109, at oil changes to prevent ring sticking and improve effectiveness of emission control systems.